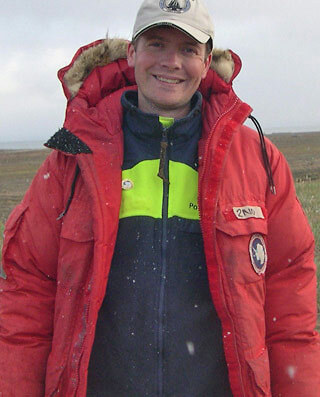 Dr. Winsor, originally from Sweden, studies Arctic circulation at the Woods Hole Oceanographic Institution. I am in charge of the Physical Oceanography part of the expedition, which means that I will try to measure temperature, salinity and pressure in the water column from the surface to 4000 m (13,120 feet or 157,480 inches) depth. I will also collect water samples from different locations and depths that we can analyze onboard. I will probably spend a lot of time on the bridge of the ship together with the captain and first mates trying to decide when and where to stop to make our measurements. Favorite food when in the Arctic? My favorite food would be Swedish pancakes! Yummy. I love my job! I get to go the remote places on Earth where few people have ever been and I get to work on things that are important for our planet. And they pay me to do that! I grew up on the West coast of Sweden in a town called Gothenburg. I moved to the US about 6 years ago. I never liked biology much, mostly because we had to do these yuky labs where we cut into cows eyes and other parts. Ew!